Substituting olive oil for butter in the polenta is an easy was to turn this into a filling vegan dish. The olive oil also gives the polenta a more earthy kind of richness. This is also a yummy way to use up those summer zucchini and radishes. Bring 8 cups water to a boil. Meanwhile, split 2 zucchinis lengthwise into quarters and slice into 1/2 inch pieces. Drizzle with oil, salt and pepper, and roast in a 400 degree oven for 5 minutes. Slice 8-10 radishes into 1/4 inch rounds. Drizzle these with oil, salt and pepper, and add them to the zucchini, roasting for another 10-15 minutes, until they are tender. Add a handful of chive flowers to the hot tray after you pull it out of the oven. When the water is boiling, whisk in 2 cups polenta and cook over low heat until all the liquid is absorbed. Whisk in 1/2 cup good olive oil, and a large pinch of salt and freshly ground pepper. 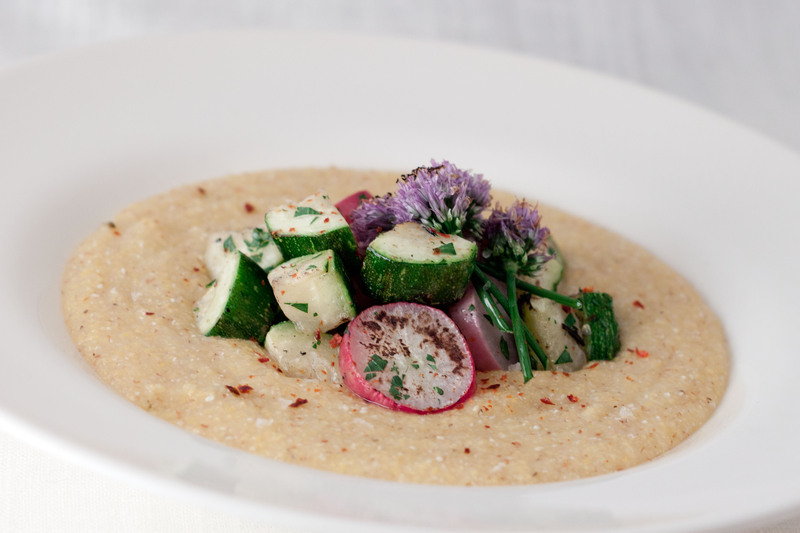 To serve, plate the polenta, top with roasted zucchini and radishes and a few chive flowers. Sprinkle on some finely chopped parsley, a pinch of crumbled piquin chili (or red pepper flakes), and Maldon salt. Hi! Lovely recipe, but I have a question- when you say “1/2 Good Olive Oil”, is there a quantity? I don’t have much experience with Polenta, so I’m curious. Lol. Sorry about that: it should say “1/2 cup”. I’ll fix that right away. The purpose of the olive oil (or butter, which is also used pretty frequently) it to help thin out the polenta and add flavor. That’s why I recommend “good” olive oil: you will taste it, so you want an oil that you enjoy. Good luck with your polenta!